This started out as a Tiffany typewriter desk. $5 yard sale find. Probably 1950’s or 60’s, I’m guessing. Other than being dirty and needing lubrication it is in good condition. At first I thought I would use it as a tool stand or something in my shop. I’m glad I changed my mind. I laminated some countertop material onto 3/4” bb ply. That brings it up to a good comfortable working height. 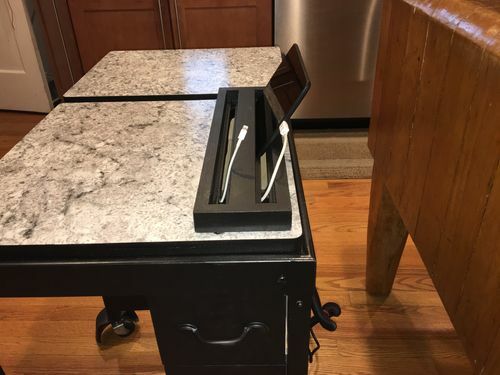 There is a rack for device charging on the top, with the charger mounted in the drawer below. All the wires get hidden in the box and fed through the rack. I am using a Trond smart charger. The charging rack is spline mitered. 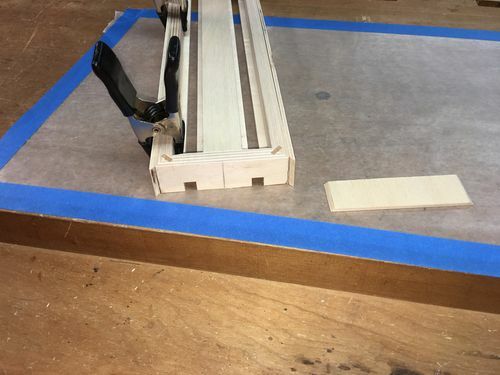 I made a jig to hold it for routing a rabbet on the bottom at the router table. A clamp onto the jig gave me something solid to hold onto.The bottom was a solid piece.The same jig was used to cut dadoes on the tablesaw. I put in a backup on the inside and the jig backed up the backside for no tearout dadoes. 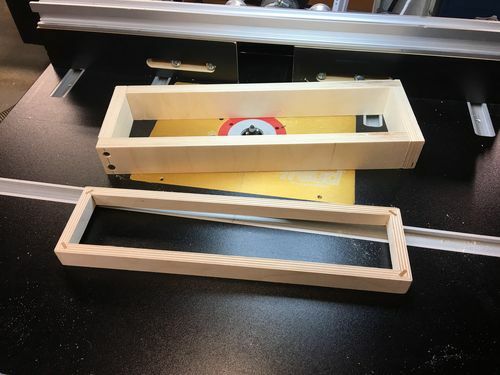 After that I glued in a divider and wrapped the rack in 1/8” bb ply to cover the dadoes. 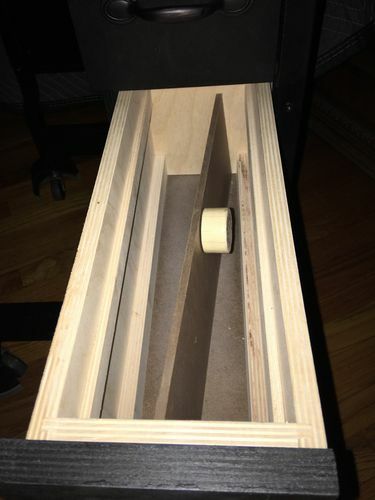 One of the drawers has a sliding rack and a false bottom, with rare earth magnets glued to the bottom side, and a key to lift it up and out. 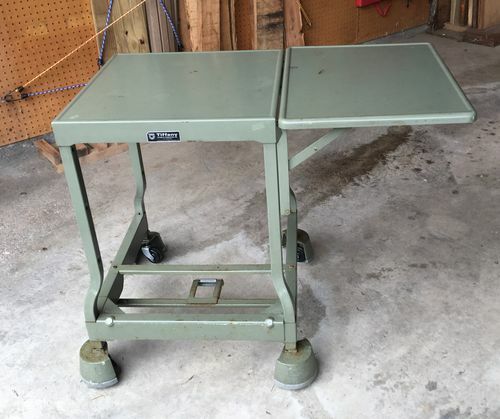 Step on that lever to lift the casters off the ground for easy moving, then release it and it locks firmly to the floor. This desk is very heavy. It was heavy enough before I did what I did to it. 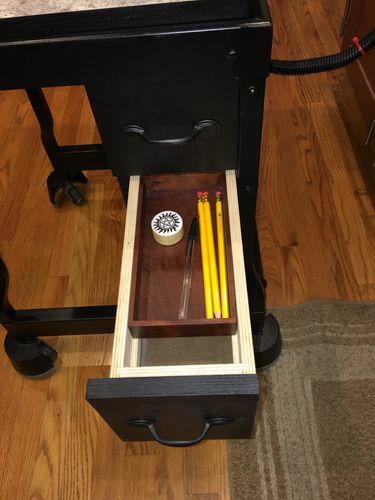 The way the desk is constructed, I couldn’t figure out a way to build a drawer box and then mount it. I built the box and then assembled it inside the frame, 1 piece at a time. I did it the hard way, but I’m happy with the results. I bought the desk in late July and completed it last week. I took the pics in the kitchen to give it a sense of scale. It has a small footprint, but a lot of function. It’s black because the teenager getting this is into everything all black. 28” tall x 18” deep . 17” x 17” desktop. 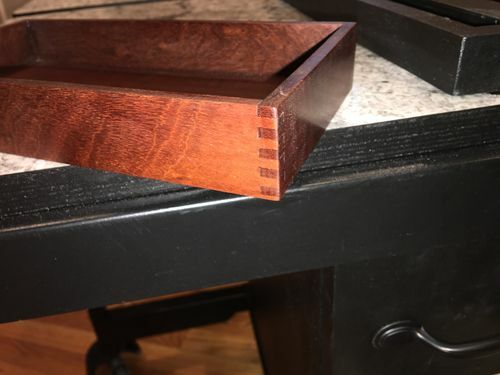 13” x 18” folding shelf. Black paint and dead flat lacquer on what didn’t get painted. Baltic birch plywood and repurposed mahogany for the tray. Nice rehab and rescue. Looks like a great laptop desk now. Very sleek and stylish refurbishment. 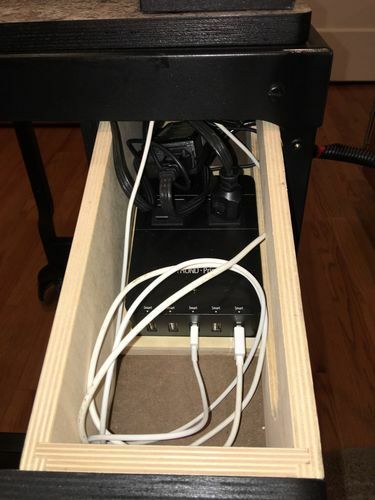 Clever ideas for the charging station and drawers as well. Looks very high end with the veneer and black paint job. Well done and hopefully well appreciated. Looks really great, Hairy….You did good on the refurb, and also on the drawers…..!! Stellar job all around..!! Very Nice Work & Well Done Hairy! Looks like very practical and compact upgrading.